The arrest and death of Freddie Gray in Baltimore by the hands of the police outraged the country, and mobilized thousands of citizens to protest against police brutality. The majority of the protests were peaceful and unnoticed, until some individuals became violent and damaged property. 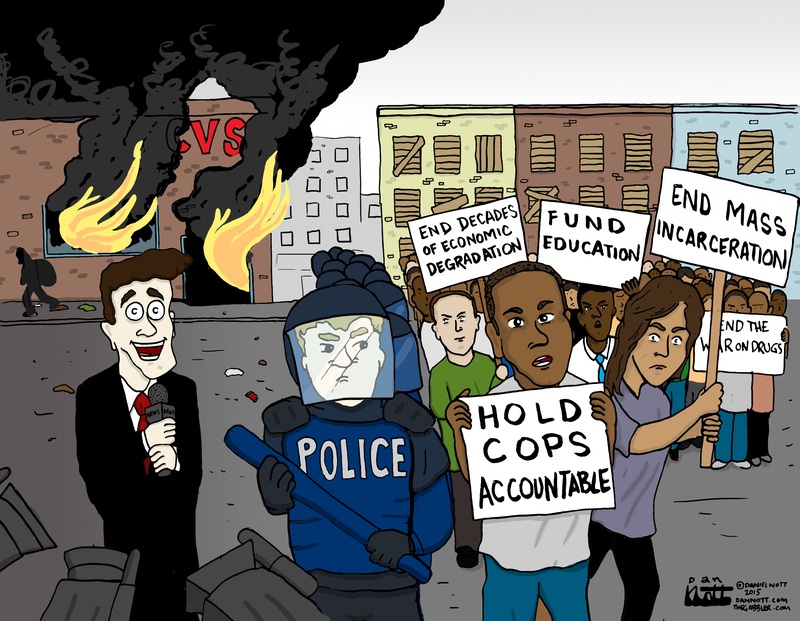 The media swarmed into Baltimore, though the direct and indirect causes of the rioting were neglected. Instead, the media pointed their cameras at the fires, and characterized a movement of citizens mobilizing to address serious grievances in their communities as looters and thugs. While the national attention could have been an directed to illuminate the economic and political context in the American city in general, the coverage provided little but rubbernecking and thinly-veiled racism. When the fires were put out the coverage stopped, but the problems in Baltimore remain.